Ear Candling, maybe some of you have heard this term. Generally, you can conclude from its term that it has relation with your ear and candles. How candles and your ear are related to each other? Let’s find the relation between the two. Have you experienced gross and dirty substance inside your ear? This accumulation of ear wax happens due to several reasons and has several impacts on your auditory system. Earwax blockage is a common problem. And there are various scientific methods to clean the earwax. As earwax can cause abnormal conditions like hearing loss, tinnitus blocks auditory hygiene etc. Therefore it becomes necessary to remove them. Can you imagine the role of candles in removing the ear wax? Well, it’s a tricky process but it exists in the form of ear candling. You will study how candles are able to treat your earwax blockage and remove it from the ear canal. Though it is an ancient process, practitioners want to adopt this process. It is a mere complex but interesting phenomena. Let us study this process in detail. Let’s start with its definition. In ancient times candles were used to get rid of the earwax. The ear candling procedure has been reported to help with cancer treatment. They are known as ear candles. And through ear candles, some procedures were done in steps to treat various ear-related problems including the removal of ear wax, debris, impurities and toxins from the ear. This procedure is ear candling. These are hollow cones made up of fabric covered in paraffin wax. Most of them are the foot in length. The pointed area of the candle is placed in the ear. The warmth created by the flame causes suction. The suction process pulls the ear wax out from the ear and put into the hollow candle. Ear Candling is a form of alternative therapy in which the tapered end of the candle is placed in person’s ear and the other end is lit with the belief that the impurities in the form of earwax, debris will come out of the ear canal. Ear candling also called ear coning or thermal-auricular therapy because of the particular shape of the candles used. 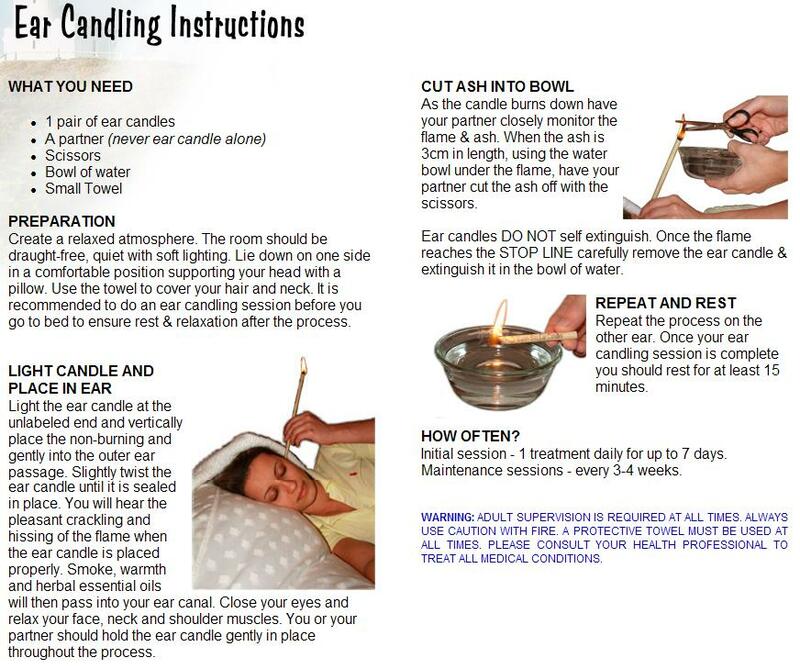 It is an alternative medicine practice claimed to improve general health and well-being by lighting one end of a hollow candle and placing the other end in the ear canal. The above definition has provided the general idea of ear candling that is what it means and what happens in this process. But it will require some tools. Thus let us study what tools you need for ear candling. This process needs specific tools to carry out the procedures. As the term denotes “Ear Candling”, you can simply conclude that you must have candles with you. As it is the indispensable kit. Now, the question arises whether these candles are similar to the general candles we use or they have specialized features. Well, let’s learn about these special candles which can treat your ear problems. They are created from a fabric structure that is coated in one of three different kinds of wax. The pointed end is placed in the ear while the wider end is set alight. They’re around 10 inches long and can cost a few dollars apiece. The original use of ear candles was for aura and spiritual cleansing for purifying. They were used to cleanse and harmonize the different energy fields of the body. Equally, they were also used in initiation rituals and healing ceremonies. The importance and use of ear candles are illustrated in numerous ancient wall paintings including those found within the caves of the Grand Canyon. These hand-made structures are hollow tubes which contain honey, sage, St Johns Wort, and chamomile. Ear candling, a traditional therapy used by the Ancient Greeks, was popularised by the Hopi Indian Tribe of the American South-West. The modern incarnation of the treatment is primarily based on the form used by the Hopi (meaning “Peaceful People”) Indians who possess great medicinal knowledge and spirituality. That’s why these candles are Hopi candles. Quite different from conventional wax candles, a Hopi Ear Candle is actually a cotton tube, impregnated with beeswax, honey, and therapeutic oils, that is painlessly inserted into the ear to draw out impurities and relieve pressure in the head and sinuses. Though ear candling is an ancient process, it is still popular in the present era. But, is it possible to carry out this process. Will it be successful? How does it work? How much time it will take? To find these answers lets study this process in the detail. How does Ear Candling work? First buy the candles, which are hollow fabric cones soaked in wax or paraffin. Cut a hole in a paper plate and stick the candle into it. This makes sure candle wax and ash doesn’t fall on your face. Lie on your side with their head supported on a pillow so the auditory canal is vertical. Your practitioner should gently insert the tapered end of the candle into your ear canal at a 90-degree angle from the ear. The resulting gentle suction and vacuum draws the wax and impurities from the ear and produces a light suction action. This vacuum is caused by the warmed air from the flame and colder air moving through its hollow center. The movement and compression between the ear canal and the candle chamber generate air flow acting as a chimney. The burning action infuses the herbs and essential oils into a vapor, which is drawn into the auditory canal. This performs a massaging function as well as softening any impurities. For 10 to 15 minutes, you’ll enjoy the pleasant, crackling sound of the burning candle as the person burning it cuts off the end of the cloth every two inches or so. When about four inches remain, the candle is removed from the ear and then blown out. Turn over and repeat with the other ear. Split the candle open and check out at all the nasty stuff inside – wax, bacteria, and debris from inside your ear. So the above steps conclude that it is a complex process and requires practitioners to carry them successfully. Though ear candling is popular, maximum researches and professionals don’t support this earwax removal by ear candling. They have different claims and reviews regarding ear candling. Unfortunately, there is no medical evidence to support the benefits of thermal-auricular therapy alleged by practitioners. Practitioners claim both positive and negative sides of ear candling. Ear Candles remove ear wax by creating suction – A study into the process found that not only did those ear wax removal candles tested failed to create a strong enough suction to realistically remove ear wax, but they actually failed to create any kind of suction at all. Fans say that as the candle burns, it creates a low-level suction force that pulls wax and debris out of your ear. Others believe heat from the candle melts and soften the wax, which falls out over the next few days. An ear wax removal candle works by melting the wax and forcing it to fall out – Wax will reharden shortly after the heat source melting has been removed, so it does not make sense that softened wax would fall out over a period of several days. The client can find debris when he will open the ear candle. They will find evidence of earwax, impurities, and toxins removed during the process. The flame creates negative pressure, drawing wax and debris out of the ear canal, which appears as a dark residue. Thermal-auricular therapy serves to clear out the interconnected passageways in your skull and leave you with a clean head. While others believe that the process will hurt the patient by the residual ashes. Ear candling can benefit conditions by affecting the head and ears such as sinus congestion, ear noises, and excessive earwax. Users often describe a soothing, light sensation in the ear/head area and a general calming, relaxing effect. According to the practitioners, Clearing the ear canal, will clean out the rest of the pathways and leave you with a clean head. Though ear candling can benefit you in various manners. But is it safe for you? Every phenomenon has positive and negative sides. Thus we have to consider both. According to various professionals, it is a dangerous process as it can harm the patient in different ways. This reveals the negative results of the ear candling. You will come to know how it can harm you if you do not carry it in a proper way. Let’s discuss the dark side of ear candling. The U.S. Food and Drug Administration (FDA) has issued a warning to consumers and healthcare providers not to use ear candles because they can cause serious injuries, even when used according to directions. The FDA adds that they have found no valid scientific evidence supporting the effectiveness of ear candling. According to the expert’s ear, candling is not safe. They have been warning people to steer clear of the practice and related products since early 2010. There are so many risks involved with ear candling, and there are no scientifically proven benefits. After the ear candling there is increasing pain in the ears. Hearing loss – Candle wax may even drip into your ear canal, clog the passage, and make you lose your hearing for a while. Ear candling can be especially dangerous for small children. The FDA notes that children and babies are at increased risk of injuries and complications from ear candles. From the above points, we can conclude that ear candling is not a safe method for earwax removal. So if you are thinking about proceeding with this process, just forget about it. Otherwise, you can be the sufferer of it. You should prefer other safe alternatives for earwax removal instead of ear candling. These safe methods will relieve you from your ear problems. Let’s go through these safe alternatives in the detail. How to remove ear wax safely? There are a variety of alternatives to ear candling that people can carry at home or refer to the doctor. Since medical professionals and organizations have approved these alternatives, they are safe and standard. Increase your intake of Omega 3 in your diet. As due to its deficiency, excessive ear wax forms and accumulates in the ear. Use natural methods for ear wax removal – Coconut oil, tea tree oil, Glycerine, Garlic, Baby Oil, Saltwater, warm water, etc. Consult your audiologist in severe conditions. An ear flush or ear irrigation is a routine procedure that can be carried out by a doctor or performed using a home kit. It involves ‘flushing’ the ear gently using a bulb syringe filled with simple warm water or a combination of water and a saline solution. Ear flushing should never be carried out if one is experiencing a perforated eardrum, a lowered immune system or an active ear infection. When in doubt, it is always best to seek medical advice first. You can also purchase drops for softening earwax from pharmacies. If you develop an earwax blockage or are experiencing symptoms (like hearing loss or dizziness), you should speak to your doctor to assess your symptoms and discuss ways to safely remove the earwax. In case, we can adopt some earwax removing methods by audiologists. Earwax has a protective role. It cleans and lubricates the ear, and can protect the ear canal from bacteria and fungus. The ear has a self-cleaning system that naturally removes earwax. Most people do not require additional cleaning. But if in case of requirement, you should visit audiologists or hearing professionals. As we have studied that ear candling is not safe and it is risky. Though it is also a process, medical professionals and organizations have disapproved it. Ear candling is a lousy way to remove wax. At its worst, it can cause serious harm to your ear. It’s also risky to hold a lit candle close to your face. The flame or the melted wax could burn you. We should know this topic but it is not a standard process. So instead of adopting this ancient process, we should go for prescribed methods of removing earwax in case of abnormal conditions. Therefore, use the candles for lightening purposes instead of using it for ear treatment.